Name:[/i] Bakura (Customized canon, w00t w00t!) and Yami Bakura. Looks: Bakura has white, propped up hair, and wears a black and white striped top. He has blue eyes, and he has the Millenium Ring around his neck. He wears a Black Trenchcoat and also wears black Jeans. Personality: Normal Bakura is kind and caring, and doesn't do much to avoid helping, he helps anyway he can. Yami Bakura is evil and loves nothing more then causing Chaos and agony, he is also after the Millenium Items. Likes: Helping and Being Kind. Dueling. Yami Bakura likes Knives, dueling, Shadow Games, Millenium items, Chaos and Agony. History: Bakura meets Yugi and his friends Katsuya Jonouchi, Hiroto Honda, and Anzu Mazaki when he is transferred to Domino Junior/Senior High School. Bakura tells his new friends that he has a love for games of all types, particularly the RPG "Monster World". However for some mysterious reason that he can not explain, everyone who has played with him has fallen into a coma. This is the main reason he transfers schools so often. When Yugi allowed him to hold the Millennium Puzzle, Bakura felt a sharp pain in his chest (later revealed to be the Millennium Ring). That night, Bakura is busy writing a letter to his sister, Amane (who had earlier died in a traffic accident), a voice announces that he is its new host. Bakura looks down in horror to find that the sharp points of the Millennium Ring are jabbing into his skin. 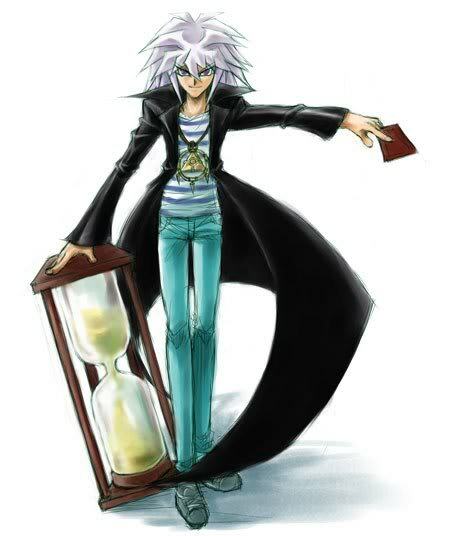 This voice is Dark Bakura, a 3,000 year old ancient spirit from Egypt (Yami Bakura is a 5,000 year old spirit in the English anime), who has his sights set on acquiring the Millennium Puzzle. Bakura sets up a miniture "Monster World" game, and the next day invites his friends to play (in the Toei anime, Miho Nosaka is also invited). Each of the group picks a type of monster they wish to play as, and Bakura seals them inside miniatures of their selected monsters. Yugi becomes a monster tamer, Jonouchi a warrior, Hiroto a magic gunman and Anzu as a magician. In the Toei anime Miho becomes a gypsy. With everyone else's souls sealed in minitures, Atemu (occuping Yugi's body) challenges Dark Bakura to free his friends. The good personality managed to emerge during the RPG, taking control of the body's left hand. The good Bakura intentionally fumbled several critical dice rolls, giving Atemu an edge in the game. Once he realized this, Dark Bakura impaled his good self's controlled hand on a tower spire of the game board's castle, laughing madly. However, good Bakura would not be defeated and sealed his soul into a pair of possessed dice. He caused the dice to shatter, effectively ending the game and killing himself in the process. The good Bakura is dead when Dark Yugi reaches him. His avatar in the TRPG is still animated, and White Mage Bakura uses his power as a level 13 mage to bring Bakura back to life. When doing this, his other self was placed back together with himself. Dark Bakura teams up with Marik Ishtar in a verbal deal consisting of Marik's relinquishment of the Millennium Rod if Bakura obtained the God Card "Slifer the Sky Dragon". Bakura stabbed his own body in the arm and released his good self. Marik pretended to save the good Bakura and took him to Joey and Tea. Bakura was taken to a hospital by Solomon Muto while Marik intruduced himself to Joey and Tea as Namu. Soon after Marik captured them. While Bakura is asleep in the hospital, Marik appears in his mind. Marik tells Yami Bakura that he now needs to enter the Battle City finals in order to recive the Millennium Rod. Bakura is woken by Solomon Muto, and turns into Yami Bakura. Solomon tells him that Yugi and Joey are qualified for the finals. Yami Bakura gets up to find them but is stopped by Solomon. Yami Bakura knocks out Solomon with his Millennium Ring and leaves the hospital. Yami Bakura aquires a place in the Battle City finals by stealing another duelist's Duel Disk and locator card and wins the remaining locator cards required off Bonz. He faces Yugi in the quarter-finals and narrowly lost, his other self's weakened body becoming a liability. Bakura is left in a coma. The Ring was lost in the Duel, but was returned by Téa being controlled. Marik in Téa's body insists on Bakura's assistance. An evil self of Marik had gained control of his body. Yami Bakura challenged what was now Marik, and ultimately lost. The Ring then fell into the hands of Yami Marik, and eventually ends up in the hands of Yugi after Yugi defeats Marik. Bakura wakes from his coma after Yugi defeats Marik.